According to Harvard, a Gap Year is a Good Thing - StudyinCanada.com! Harvard University recently released a statement encouraging admitted students to defer their enrolment in favour of a Gap Year. In lieu of graduating high school only to rush straight into college or university, the Ivy League university has started encouraging students to take a year off and travel, pursue a special project or spend time in another meaningful way. If a glowing recommendation from Harvard isn’t enough, here are some of the reasons you should delay your studies in favour of a Gap Year. Overnight in the desert? Boat ride up the Amazon? Yes please! While taking a Gap Year doesn’t necessarily mean travel overseas, it’s a great opportunity to pack things up and see the world. After all, it’s one thing to swipe your way through Instagram in admiration of other people’s travels, but what if you could step away from everything you know and experience the reality of a world outside your own? FACT: According to an Erasmus Impact Study in 2013, 64% of employers think that an international experience is important for recruitment. From bartering their way through the markets of Morocco to navigating the busy streets of Lisbon, London and Barcelona, Class Afloat students quickly acquire the self-confidence and awareness necessary to master independent travel. 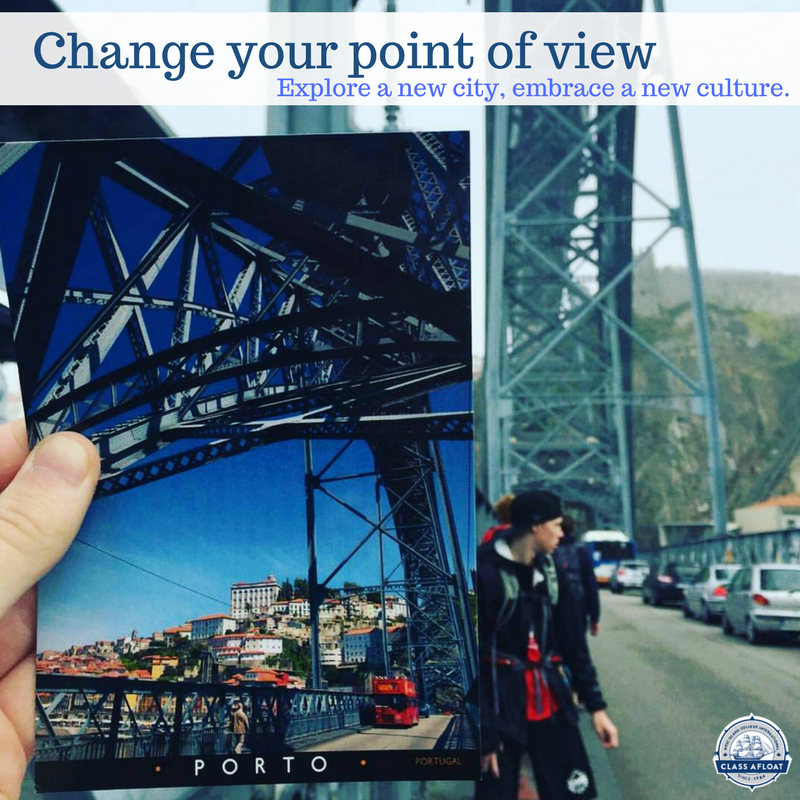 Port programs coordinated by Class Afloat faculty also help expose students to historical and cultural highlights as well as outdoor activities like white water rafting in Costa Rica and scuba diving in Brazil. Download a copy of the 2018-2019 itinerary here. You might think of networking as a concept reserved for business professionals but don’t be fooled – networking your way to future opportunities starts now. Find a friend – and be one. Learn the art of conversation. And use your time off to meet with people who have visions that differ from your own. Gain some perspective and forge friendships that last a lifetime. Class Afloat’s international crew is made up of students from Canada, France, Mexico, Spain, Italy, USA, Japan, Colombia, South Africa, Bermuda and more! Sail with a crew that feels like family. Hear from Class Afloat students. While you’re out there, seeing what the world has to offer, why not think about what you can do to give back? One of the benefits of joining a structured Gap Year program is the opportunity to participate in volunteer projects around the world. Partnering with the right organization ensures that you are approaching volunteer work in a sustainable way. For over ten years, Class Afloat has partnered with Student Youth Travel Organization (SYTO) in Senegal and the Fundacion Mahatma Gandhi in the Dominican Republic to bring students meaningful and unforgettable volunteer experiences. In addition to their volunteer work on the ground, students experience a homestay with Senegalese and Dominican families and learn how life in both countries differs from life at home. LOSE YOURSELF. THEN FIND YOURSELF. If you’re feeling a little stressed, anxious or (dare we say it) lost as you wrap up your high school years and take off in search of whatever comes next, don’t panic – you’re definitely not alone. From worrying about final grades and university acceptances to imagining what life will look like ten years down the road, today’s generation of students are forced to think fast, and think ahead. What if you could just put your life on pause and breathe a little bit? Figure out what you really want to do or maybe what you don’t want to do. There’s a reason European students are generally encouraged to take at least a year abroad. It helps them gain perspective – and experience, that oh so annoying buzzword that looks great on resumes and opens doors to entry-level positions straight out of college. More often than not the biggest lessons we learn about ourselves and the world around us come from planting two feet squarely outside our comfort zone. Finding the time to do that as a student is tough – finding time to do that as an adult with debt, a career and a family is impossible. If you’re hung up on the financial hurdles, give yourself time to fundraise and research scholarships available to help fund programs like Class Afloat that offer Gap Year programs for high school or university credit. FACT: In 2016 Gap Year Association Members and Provisional Members gave away a combined total of more than $4,200,000 in scholarships and needs-based grants. Email any Gap Year organization of interest and ask if they offer any scholarships or bursaries for prospective students. Many, like Class Afloat, offer scholarships available based on both financial need and merit. Details and deadlines for Class Afloat scholarships available here.